The Basilicata coast has been compared to the Amalfi coast in our guide book. Is it comparable? We don’t know yet because our trip to the Amalfi coast was cut very short due to poor weather. One day we will find out, but for now this is our favourite stretch of coast in Italy and we think it’s pretty spectacular. 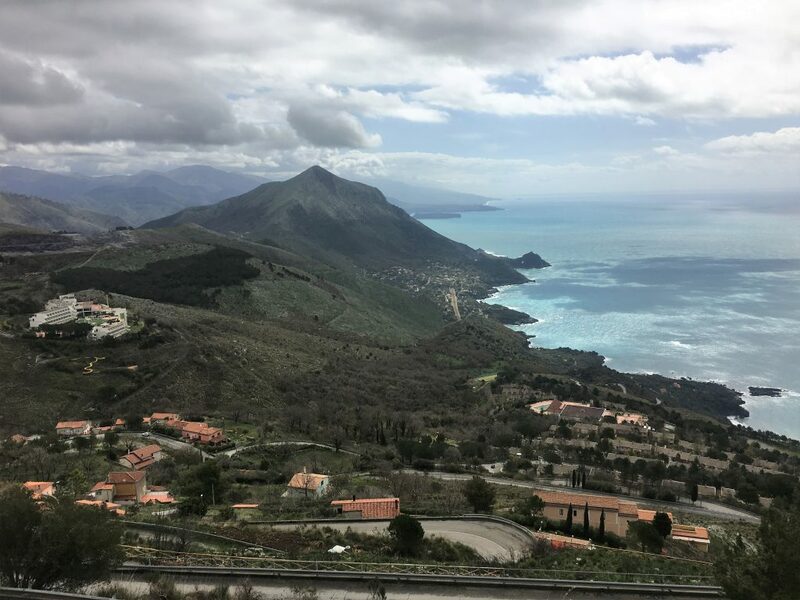 From Sapri the road meanders around the coast to Maratea. There was a road closed sign at the start of the route, but we managed to work out that the road was closed beyond our destination. 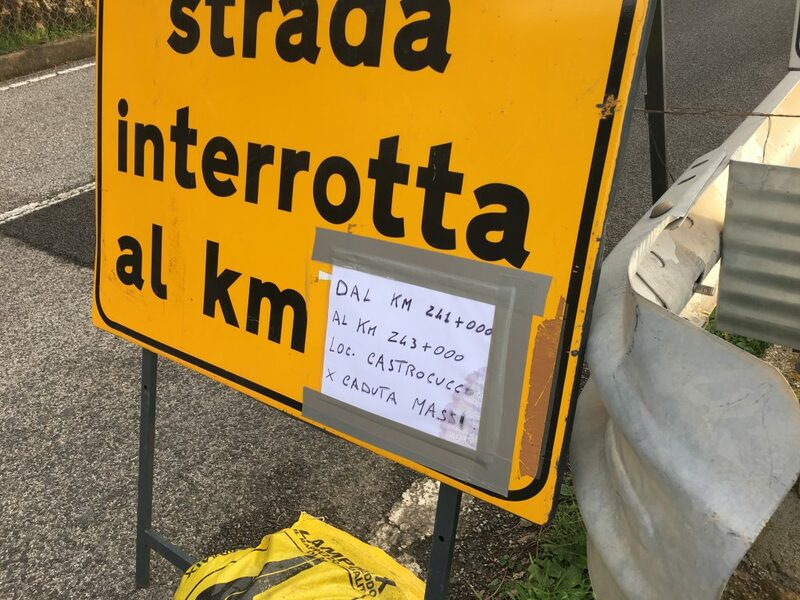 The road is two lanes but narrows in places, as it crosses bridges over river gorges and also in the village of Acquafredda where there are traffic lights. I don’t know how we’d feel driving in high summer with large vehicles travelling in both directions, but it was an enjoyable drive in the low season. 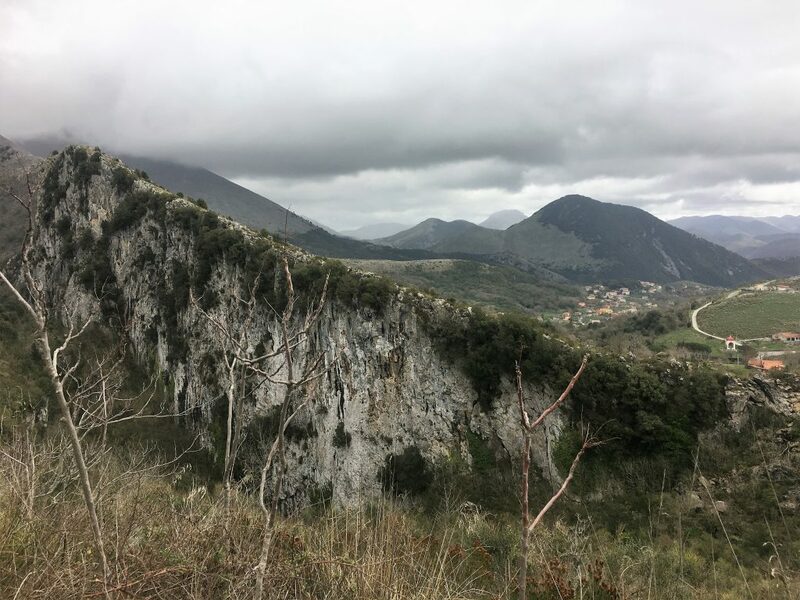 We started off by heading to Maratea harbour where google showed a large area of parking. This no longer exists, the surface had been scalped and it was gated off. 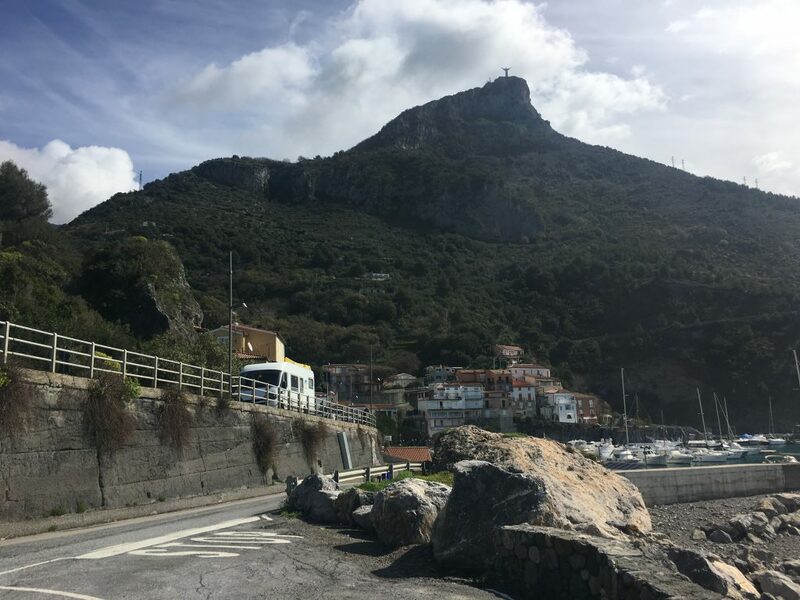 But we easily found some roadside parking and stopped to have breakfast in view of the sea which was sparkling in the early morning sunshine. We’re not fans of roadside parking, we feel a bit exposed to bumps and scrapes, so after breakfast we moved up to the higher part of the village where we parked in the market square. 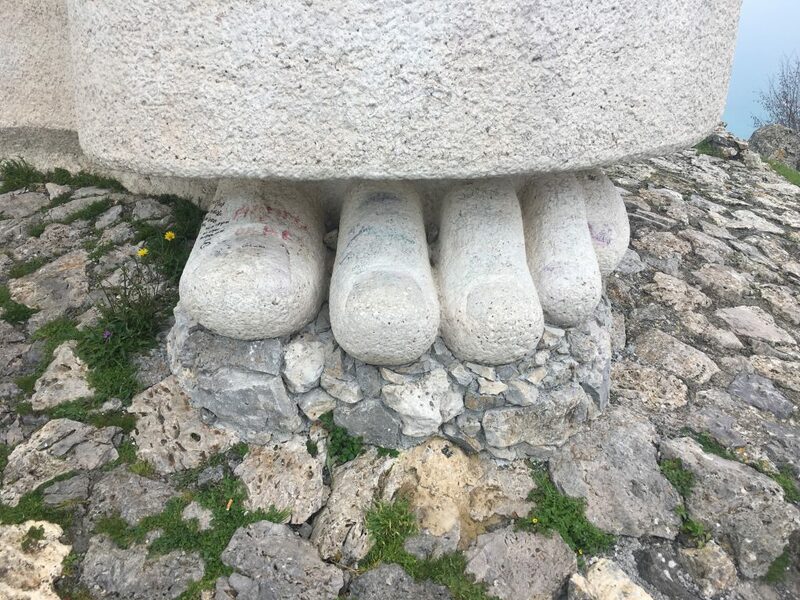 We thought we would go for a quick stroll from here up to see the large statue of Jesus that stands watch over the village and harbour. Its not a long walk although it’s pretty steep. By heading up through the steep streets of the oldest part of town you can find the small Chapel of Cappuccini. The path branches off here, marked with red and white slashes, taking you up through the woods, past another chapel and eventually coming out in the large car park just below the statue of Christ (there are motorhome spaces in the car park). 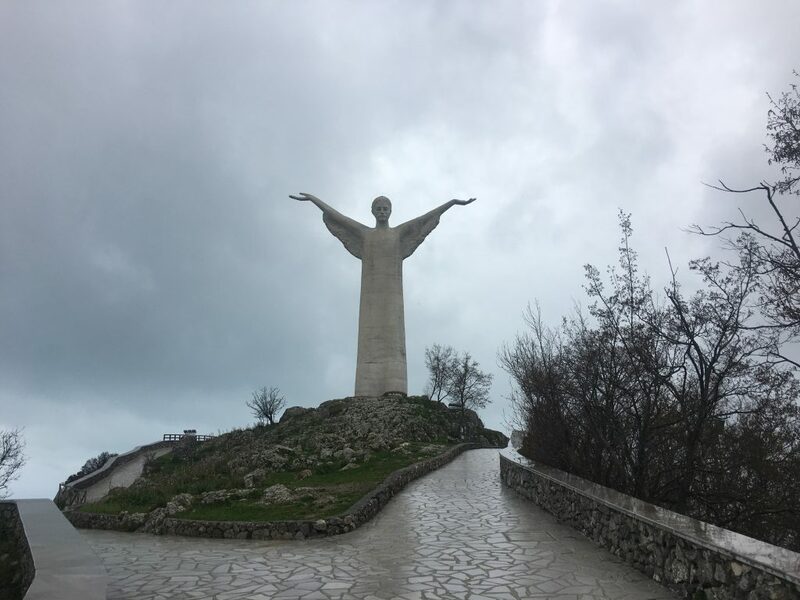 A further short walk up the road from here takes you to some abandoned village houses right on the top of the ridge, the pristine Basilica di San Biagio and a well maintained pedestrian area and steps up to the statue. In high season there is a gift shop and café here, but nothing was open today. The views here were spectacular. The road that has been built to bring people to the top is impressive in it’s own right, the switchbacks standing on stilts over the mountainside. Plus you can see in both directions along the coast and to the hills and valleys inland. Unfortunately what we could see form here was a large bank of very dark cloud heading quickly towards us. As we had just been out for a stroll we hadn’t bought all of our waterproof gear with us. We took shelter in the church porch when the rain started, but soon realised that we wouldn’t be seeing any sunny spells. Our walk down took less than half the time of the walk up. We dashed down to see if the trees would give us any shelter, but they were so burdened with rain that they were unable to provide any shelter. As we reached the village the roads started to become water features. The drainage systems spewed water from rooftops directly into the streets where it ran over the surface of the roads, the drains unable to cope with the volume. For the second time in a couple of days we had been drenched. I remember once we sent Aaron to a swimming lifesaving class where he had been asked to take trousers and a jumper to do training in wet clothes. We sent him with a fleece, poor thing, not realising that fleeces act like a sponge and just hold the water. We re-learnt that lesson today with our fleece jackets so saturated that our sleeves were hanging inches below our hands. Back at Bertie we quickly took refuge inside, stripping off our wet clothes and trying to squeeze as much water out of them before hanging up in the bathroom where they continued to drip into the shower tray.